Dear brothers and sisters in Christ! Throughout our millennial history, our Church and our people have fully experienced in their bodies the experience of the Paschal Mystery of our Saviour. We have passed through difficult sufferings, have repeatedly experienced death and resurrection. We see the victory and the joy of the resurrection with our own eyes in a free, independent, and united Ukraine. Today, looking again into the eyes of the invaders, we ask the Lord: “Why did you raise us up? What is your plan (pronoia) for us?” To these questions, Divine Wisdom gives us an answer through our own Sophia of Kyiv! 12. The great confessor of the faith humbly commanded his descendants: “Bury me in our Patriarchal Sobor of Holy Sophia, but when our vision becomes reality and our Holy Church and our Ukrainian nation will arise, take my coffin, in which I will lie in rest, to my native Ukrainian land...If such be the will of God and the will of God’s Ukrainian people, lay my body in the crypt of the renewed Cathedral of Saint Sophia.” Patriarch Josyf felt that Divine Wisdom reminds us of the task of restoring the original unity of the presently divided Church of Kyiv. 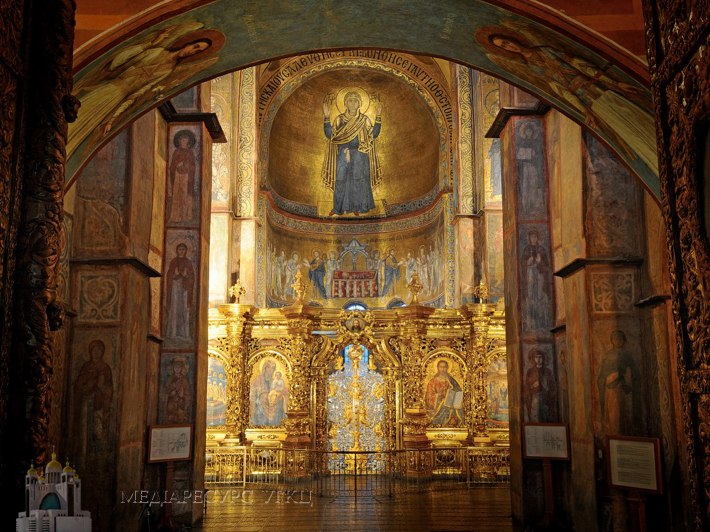 Only then will we see a truly renewed Cathedral of Saint Sophia in Kyiv. Until this unity exists, none of the Churches that are heirs of this Church can alone take up the ancient Cathedral of the Wisdom of God, Sophia of Kyiv. It must rather be the meeting place for all the descendants of the sophianic Church of Kyiv, to be a reminder, a call, a watchman, and a hope of our unification in Christ. 19. In his pastoral message to the clergy of our Church, written in the Krasnoyarsk region, Patriarch Josyf Slipyj, of blessed memory, compares the history of the Church of Christ to the cross-bearing (stavrophoric) procession of the righteous and martyrs for the Truth of God: “And in this cross-bearing procession, a separate row is made up of the confessors of our Greco-Catholic Church...There you see your grandparents and great-grandparents, parents and relatives, many of your spiritual children, friends, and acquaintances...Behind those worthy, venerable, and holy ancestors, you follow with your heavy crosses, falling under them not once or twice, but repeatedly, only to rise again. They are all with you in your struggle for the Church and its unity, to bear your heavy cross with you in spirit and prayer!” Sophia of Kyiv is also the wisdom of our people (phronema), which is manifested in times of suffering and gives the power to transfigure the pain and sadness of persecution into the ineffable joy of faithfulness to Christ, into spiritual victory over the forces of fear and gloom, and into the triumph of the resurrection. Our Church has always been conscious of its mission before its own people and the whole world to proclaim the Gospel “not with eloquent wisdom of discourse,” but by the love of the cross of the Lord, which “to us who are being saved it is the power of God” (1 Corinthians 1:17). “Повчання Володимира Мономаха (за Лаврентіївським списком),” Золоте слово. Хрестоматія літератури України-Руси епохи Середньовіччя ІХ – Х століть., vol. 2, ed. Vasyl Yaremenko (Kyiv: Аконіт, 2002).